Follow in the footsteps of the almighty Gods in the new and exclusive release by Blueprint Gaming – it offers payouts of 5,000 times your stake on every spin. Journey of the Gods is a simple 5 reel, 10 payline slot that can be played from just 10p per spin on desktop, smartphone and tablet devices including iOS and Android. With an ancient Greek mythology theme, you join the gods high up in the sky for huge payouts hopefully. With high value symbols on the reels, keep an eye out for the Journey of the Gods logo symbol as 5 of them across a payline will reward you to the tune of 500 times your stake. There’s also a sun wild symbol to help you form winning combinations. Journey of the Gods is a cascading reels slot meaning winning symbols disappear to be replaced by new ones – this means you can win again and again from each spin. If you get 4 consecutive cascades, you’ll play the Free Games feature. Beginning at 10 free spins, each cascade after the 4th will give you additional free spins – there’s 50 free spins to be won from 8 consecutive cascades. During the feature, cascades will give you more wins and extra free spins. There are no limits to how many you can play with. 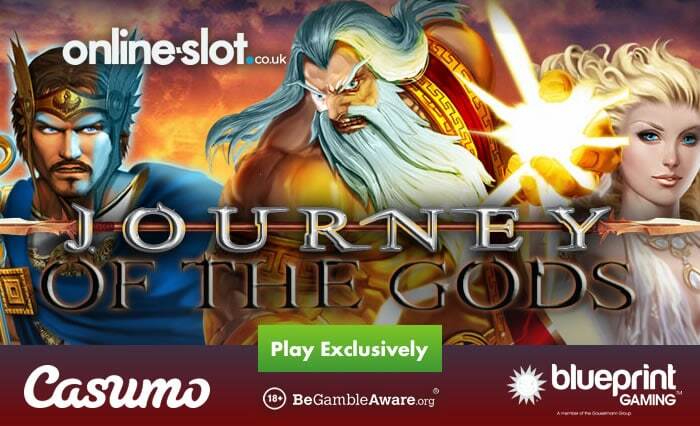 If you manage to fill the reels with the high value logo symbol, you’ll win 5,000 times your stake – read the Journey of the Gods slot review for full details. Journey of the Gods is only available at Casumo Casino – they have also released Blueprint Gaming’s Vikings Unleashed MegaWays today. Casumo has a special relationship with Blueprint Gaming as it’s the only online casino that offers Grizzly Gold too. Another exclusive slots they offer you include Quickspin’s Ivan and the Immortal King. Read enough? Sign up to get 20 no deposit free spins on NetEnt’s Starburst and a 100% first deposit bonus up to £300.